CVA is the traditional, full-profile conjoint analysis, similar to the first conjoint methodology proposed in the 1970s. It can display either one or two products at a time. It may be used for paper-based or computer-based interviewing. 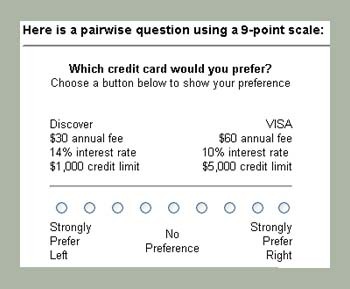 It is useful for both product design and pricing research, when the number of attributes is about six or fewer. CVA/Web is a component within the SSI Web platform of tools. It is typically used for product design and pricing research, where the number of attributes studied is about six or fewer. CVA is especially advantageous when collecting small sample sizes.